NOAA's most recent West Watch was held on 22 January 2019. The webinar summarized coastal environmental conditions and impacts in the Western Region. The webinar included contributed slides from the NANOOS, CeNCOOS, and SCCOOS regions, who regularly report on their local coastal ocean conditions. The next webinar date is TBD. Contact us at NANOOS if you want to participate and please let us know if you have any comments! Are you prepared for a tsunami? NANOOS, in partnership with the Oregon Department of Geology and Mineral Industries (DOGAMI) and the Washington Department of Natural Resources, has a new (free!) smartphone app showing Pacific Northwest evacuation zones. Whether you are a coastal resident or just taking a trip to the coast, you can use the app to see if you are in a tsunami evacuation zone, plan your evacuation routes, and download published evacuation brochures. If you are logged into your myNANOOS account, all your places will be saved automatically! Oregon residents can create custom brochures centered on their area of interest. The app is available from the Apple App Store and Google Play Store. NANOOS Outreach staff will be providing demonstrations of the NVS Boaters App at upcoming boat shows in both Portland, Oregon and Seattle, Washington. Join us at the NANOOS booth at the Portland Boat Show during January 12-13 to try out the NVS Boaters App. Catch the live demonstration at the Seattle Boat Show on January 31 at 12:15 in the North Hall. The NVS Boaters App provides users with real-time and forecast water and weather data in order to plan safe trips. A comprehensive look at Puget Sound marine conditions for the year 2017 is now available. Physical, chemical, and biological information, ranging from large-scale climate variations to local biota monitoring, is summarized to provide a thorough overview of conditions in Puget Sound and the surrounding area during 2017. The report includes many contributions from NANOOS. This report is published by Puget Sound Partnership and NOAA's Northwest Fisheries Science Center as part of the Puget Sound Ecosystem Monitoring Program. NOAA's most recent West Watch was held on 27 November 2018. The webinar summarized coastal environmental conditions and impacts in the Western Region. The webinar included contributed slides from the NANOOS, CeNCOOS, and SCCOOS regions, who regularly report on their local coastal ocean conditions. The next webinar is scheduled for 22 January 2018 at 1 pm. Contact us at NANOOS if you want to participate in the survey they are conducting to evaluate if this series continues. Please let us know your comments! The Pacific Coast Collaborative and the federal Interagency Working Group on Ocean Acidification have partnered to foster a West Coast ocean acidification and hypoxia (OAH) monitoring network that is scientifically grounded and responsive to management needs. A Task Force was established to proceed toward this goal by building a comprehensive inventory of OAH-relevant monitoring efforts, from Alaska to California. Access the inventory and further information below. NOAA's Western Regional Collaboration Team brought back its popular webinar series again and will present every other month. The September 2018 webinar summarized coastal environmental conditions and impacts in the Western Region. The webinar included contributed slides from the NANOOS, CeNCOOS, and SCCOOS regions, who regularly report on their local coastal ocean conditions. The next webinar is tentatively scheduled for 28 November 2018 at 1 pm. Contact us at NANOOS if you want to participate and to make sure this series continues, let us know your comments! The IOOS Pacific region OA data portal is now the IOOS Partners Across Coasts OA data portal, with the same great URL and acronym. This data portal provides ocean acidification relevant data for diverse user groups, from shellfish growers to scientists to managers to the public. Originally built for the west coast of the United States, the geographic scope of the portal is now expanding to the entire nation with support from U.S. IOOS and NOAA’s Ocean Acidification Program and to Canada, through our partnership with the Hakai Institute and others. The Submaran S10, an autonomous surface/underwater vehicle powered by wind and solar power, will be deployed on a test mission to sample seawater for harmful algal bloom (HAB) cells off the Washington coast. Samples from two 1-2 day pilot missions will be delivered to the Makah Tribe Water Quality Lab for analysis. Funded by U.S. IOOS via NANOOS, the effort is contributing to the development of a NOAA Pacific Northwest HAB Bulletin, a forecast system that supports the management of shellfisheries, clamming beaches, and human health. This work is a collaboration of NOAA’s Northwest Fisheries Science Center, University of Washington Applied Physics Lab (APL), NANOOS, the Makah Tribe, the Olympic Region HAB (ORHAB) partnership and OceanAero. Our IOOS OTT team led by John Mickett (UW & NANOOS) and Stephanie Moore (NOAA NWFSC) deployed the Environmental Sample Processor "ESPeddie" ~15 miles off La Push for the next six weeks to aid managers and scientists understanding HABs. This fifth deployment was funded by IOOS and NOS. ESPeddie samples Pseudo-nitzschia and domoic acid levels, with the near-real time data served by the NANOOS Data Visualization System (NVS) and the "Real-time HABs" app, which incorporates contextual data and other data products (e.g., maps of water paths) to enhance interpretation and understanding of the ESP data. NANOOS held an official signing ceremony with U.S. IOOS Program Director Carl Gouldman (middle) at our annual GC/PI meeting on August 16 to celebrate our certification this past spring by NOAA as a Regional Information Coordination Entity. With the certification of CeNCOOS last week, all 11 IOOS Regional Associations are now certified by NOAA for their data management, governance, and infrastructure practices! See the U.S. IOOS press release announcing this important milestone. The new NVS "Seacast" app was designed for the coastal fishing community, allowing users to see forecasts for a variety of ocean conditions up to three days out for any location in the region. Building on the web app that Oregon State University PIs have been designing and testing since 2012 via Oregon Sea Grant funding, the app has now been transitioned to NVS, with new features we added based on requests by users at our NANOOS community workshop last summer. See the article below for the fascinating story of Seacast’s development, and be sure to check out Seacast on NVS! Save the Date for Biology! NANOOS, CeNCOOS, and SCCOOS are teaming up for a Biological Observations Workshop on Nov 7-9 in Santa Cruz, CA, focusing on animal movement and marine biodiversity. The goal is to identify priority stakeholder needs for regional telemetry and other types of observations of aquatic species that could be served by an Animal Telemetry Network/Marine Biodiversity Observing Network/Ocean Tracking Network baseline network and evaluate current capabilities. We invite both stakeholders with biological information needs and scientists working in this field. NOAA's Western Regional Collaboration Team brought back its popular webinar series again and will present every other month. The July 2018 webinar summarized coastal environmental conditions and impacts in the Western Region. The webinar included contributed slides from the NANOOS, CeNCOOS, and SCCOOS regions, who regularly report on their local coastal ocean conditions. The next webinar will be 25 September 2018 at 1 pm. Contact us at NANOOS if you want to participate. We are soliciting input from our community on usage of the NANOOS data portal (NVS), and its associated products and tools. Please take this 5 minute survey to better inform us. Thank you! Ready to hit the waves? Check out our new "Surfers" app! Here you will find webcams, observations, forecasts for eight different measures of wave conditions, Surfrider's water quality data, and other useful information. A big thanks to Oregon and Washington Surfrider for helping develop the app! NOAA's Western Regional Collaboration Team brought back its popular webinar series again and will present every other month. The May 2018 webinar summarized coastal environmental conditions and impacts in the Western Region. The webinar included contributed slides from the NANOOS, CeNCOOS, and SCCOOS regions, who regularly report on their local coastal ocean conditions. The next webinar will be 24 July 2018 at 1 pm. Contact us at NANOOS if you want to participate. Beach season is here, and with it comes the newest NVS app, "Beach View"! This app will give you water quality data, tide tables, and wave and wind information to help you plan your next beach expedition. It also features a collection of webcams from across the Northwest to give you a peek at conditions in near-real time. The newest version of the NANOOS Visualization System (NVS) has been released. This version features "Seacast", a new app designed for the coastal fishing community. Based on a project by Oregon Sea Grant and Oregon State University, the app allows users to see forecasts for a variety of ocean conditions up to three days out. Additionally, all apps have an improved user interface with consolidated map overlays and a helpful guide to walk users through different aspects of the app and introduce new features. NANOOS is Now Federally Certified! NANOOS passed the requirements for Certification as a Regional Information Coordination Entity (RICE) of the federal government. Certification as a RICE means that NANOOS' governance is transparent and linked to regional priorities, our people are qualified, and our data are sound. Complying with IOOS data standards ensures the data are reliable, freely available to the public, and will be archived at NOAA’s National Centers for Environmental Information. NANOOS hosted the first U.S. Integrated Ocean Observing System (IOOS) Biological Data Training Workshop, co-sponsored by the Ocean Biogeographical Information System (OBIS), on February 8-9 at the University of Washington in Seattle. The workshop provided discussion and hands-on training for analyzing and managing marine biological data with the goal to make this information accessible on an international scale. More than 30 experts from government, academia, and private industry came together in Seattle, Washington, for the inaugural National Coastal Ecosystem Moorings Workshop, which NANOOS helped lead. Organized and hosted by the Alliance for Coastal Technologies (ACT) and sponsored by NOAA/U.S. Integrated Ocean Observing System (IOOS), participants discussed configurations of ecosystem moorings, use requirements, current and emerging sensors, technical needs, deployment and maintenance, and the integration with other observing systems. Expanding the suite of existing water column ecosystem moorings in the coastal regions of the United States is one of the recommendations of the National Strategy for a Sustained Network of Coastal Moorings. NOAA's Western Regional Collaboration Team brought back its popular webinar series again and will present every other month. The March 2018 webinar summarized coastal environmental conditions and impacts in the Western Region. The webinar included contributed slides from the NANOOS, CeNCOOS, and SCCOOS regions, who regularly report on their local coastal ocean conditions. The next webinar will be 22 May 2018 at 1 pm. Contact us at NANOOS if you want to participate. The Global Ocean Acidification Observing Network (GOA-ON) updated website, based on the NANOOS website, was recently launched. From the GOA-ON website, one can access the interactive data portal, updates from GOA-ON, and other related resources. The upgrade of the GOA-ON website was a collaborative effort between NANOOS and NOAA's Pacific Marine Environmental Laboratory. Want information on Fukushima Radiation Levels in the Pacific Northwest? The Integrated Fukushima Ocean Radionuclide Monitoring (InFORM) is such a resource. InFORM works to acquire data and assess risks associated with the 2011 Fukushima nuclear disaster, while making this information available to the public. This collaborative effort involves academic, non-governmental organizations and citizen scientists. InFORM scientists have collected water and biological samples from the NANOOS region, which can be accessed from their website. NOAA's Western Regional Collaboration Team brought back its popular webinar series again and will present every other month. The January 2018 webinar summarized coastal environmental conditions and impacts in the Western Region. The webinar included contributed slides from the NANOOS, CeNCOOS, and SCCOOS regions, who regularly report on their local coastal ocean conditions. The next webinar will be 20 March 2018 at 1 pm. Contact us at NANOOS if you want to participate. The high-resolution "SalishSeaCast" University of British Columbia (UBC) model, funded by the Marine Environmental Observation Prediction and Response Network (MEOPAR), can be accessed on the NVS Data Explorer App. This model includes temperature and salinity now-casts from the surface to 415m depth, covering the Strait of Georgia and Salish Sea. Join the California Coastal Acidification Network (C-CAN) for this webinar on Monday, January 8 at 1 pm PST. Learn about and view initial results from two carbon chemistry forecasts featured on the NANOOS portal. Dr. Parker MacCready, University of Washington, will present on the LiveOcean 3-day forecast model, and Dr. Samantha Siedlecki, University of Connecticut, will present on JISAO's Seasonal Coastal Ocean Prediction of the Ecosystem (J-SCOPE) model. Joe Schumacker, Quinault Indian Nation, will also share his perspective on the needs and utility of such tools. Forecasts for Pycnocline and Thermocline Depths now on NVS! Thanks to feedback received from the fishing community, the NVS Data Explorer and Tuna Fisher apps now include forecasts for pycnocline and thermocline depths for the NANOOS region, indicating the areas and depths at which fish are more likely to be found. These 5-day forecasts are produced from the Oregon State University Regional Ocean Modeling System (ROMS) model. NOAA's Western Regional Environmental Conditions and Impacts Coordination project brought back its popular webinar series again and will present every other month. The October 2017 webinar summarized coastal environmental conditions and impacts in the Western Region. The webinar included contributed slides from the NANOOS, CeNCOOS, and SCCOOS regions, who regularly report on their local coastal ocean conditions.The next webinar will be 23 Jan 2018 at 1 pm. Contact us at NANOOS if you want to participate. NANOOS staff shared a booth with NOAA at the annual Pacific Marine Expo from 16-18 November 2017 in Seattle, Washington. This event is the largest commercial fishing and marine tradeshow on the West Coast, with attendance from fishermen, shipyard workers, captains, charter boat operators, port officials, and other groups affiliated with the maritime industry. NANOOS participation in this event was an opportunity to present the NVS Boaters and Tuna Fishers Apps to this user group, and gain valuable feedback. NANOOS participated in the Discover Science Weekend on 10-11 November 2017 at the Seattle Aquarium. This year's event welcomed over a thousand visitors each day. The exhibit by NANOOS, which included a "Great Build a Buoy Challenge" and NVS demonstrations, was very popular with kids of all ages. NANOOS will be engaging with users and the public at various outreach events throughout the Pacific Northwest in the coming month. The "State of the Coast" annual one-day meeting for Oregon coastal community members will be taking place in Florence, Oregon on October 28. Craig Risien, researcher at Oregon State University and NANOOS data management staff, will be presenting on ocean condition forecasts, including related NANOOS products. Join us on November 10 – 11 at the Seattle Aquarium for the annual "Discover Science Weekend", where NANOOS staff will be hosting the great "Build-a-Buoy" challenge and demonstrating the NANOOS Visualization System (NVS) to the public. See links below for more information on these two events. See you there! This year's U.S. Integrated Ocean Observing System (IOOS) fall meeting was held at the University of Washington campus in Seattle, Washington. The meeting included participation from the IOOS Program Office, the IOOS Association staff and board members, directors of the Regional Associations, and NOAA staff from other offices. Discussion topics included sustaining existing observations, next steps to implement the national coastal mooring strategy, gaps in the observing infrastructure, updating the IOOS Strategic Plan, transitions in modeling, and engaging with the Alliance for Coastal Technologies (ACT). These annual meetings continue to foster the coordination and collaboration for our distributed system. NOAA's Western Regional Environmental Conditions and Impacts Coordination project brought back its popular webinar series again and will present every other month. The August 2017 webinar summarized coastal environmental conditions and impacts in the Western Region. The webinar included contributed slides from the NANOOS, CeNCOOS and SCCOOS regions, who regularly report on their local coastal ocean conditions.The next webinar will be 24 October 2017 at 1 pm. Contact us at NANOOS if you want to participate. NANOOS held its annual Principal Investigator and Governing Council meetings on August 10 - 11 in Vancouver, Washington at the WSU Vancouver campus. Over 20 attendees from diverse NANOOS member institutions were present to review progress to date as well as plans for the upcoming year. Many thanks to Dave Easter from the IOOS Program Office for calling in to share IOOS updates with our Governing Council. View Presentations from Governing Council Meeting (PDF)Want to Become a NANOOS Member? High-Frequency Radars Coming to the Washington Coast! NANOOS is pleased to announce that it has received funds for two high-frequency (HF) radars to measure coastal surface currents. These assets will be sited in Washington state as part of the fiscal year 2017 award from NOAA, entitled "Sustaining NANOOS, the Pacific Northwest component of the US IOOS". Surface current data from HF radars can be used for search and rescue, tracking HABs or other floating items, model skill enhancement, maritime safety, and environmental risk reduction. This add was part of a "Fill the Gaps" IOOS Association campaign aimed to address observing gaps in our national system. Great Attendance at the NANOOS Community Workshop! A big thank you to over 60 people who attended our NANOOS Community Workshop on July 13th in Newport, Oregon. During the one-day workshop, participants learned about what NANOOS is doing and explored NANOOS products and services including NANOOS' data portal, the NANOOS Visualization System and its many topical specialized apps. Most importantly, the participants provided us with helpful feedback on our products. We look forward to implementing some useful modifications. The newest version of the NANOOS Visualization System (NVS) has been released. This new version includes climate indices and Bakun upwelling indices and anomalies, all available in the Climatology app. Users can view interactive plots, and download historical data directly from NVS. Additionally, the Tsunami Evacuation app has updated the Washington state evacuation zones, as well as evacuation brochures. NOAA's West Watch webinars summarize coastal environmental conditions and impacts in the Western U.S. Region. The 6 June 2017 webinar included contributed slides from NANOOS, CeNCOOS and SCCOOS, who regularly report on their local coastal ocean conditions. The slide deck may be accessed below. The next webinar will be 22 August 2017 at 1 pm. Contact us at NANOOS if you want to participate. You are invited to a NANOOS community workshop. At this one-day workshop learn about what NANOOS is doing and explore NANOOS products and services including NANOOS' data portal, the NANOOS Visualization System. and provide feedback on our products. During the course of the day we will break out into small groups to understand your particular data needs, get feedback on our products and services, and explore any other ways we can provide a service to your user group. The workshop will be followed by a science talk at the Hatfield Marine Science Center by OSU oceanographer Dr. Burke Hales, titled "What Drives Estuarine Acidification?". The NVS Climatology app now includes data from multiple climate indices relevant to the NANOOS region, from 1980 to the present. These indices include the Multivariate ENSO Index, the NINO 3.4, the North Pacific Gyre Oscillation, and the Pacific Decadal Oscillation. Additionally, the app features Bakun upwelling indices and anomalies for 42, 45, and 48 °N over the same time range. These data are particularly useful in identifying variations in the climate system and upwelling conditions over the past three decades. Plan your next trip using the NVS Boaters App, which offers features like current sea and weather conditions, tide and currents forecasts, and marina information to keep you informed before you go out. Use the new routing capability over NOAA nautical charts to safely plot your course, then log in to save your routes for another time. Check out the following article from Three Sheets Northwest which highlights some of these features. The NVS Climatology App enables comparison of current and past water temperature and other variables from buoys and satellites, allowing you to track anomalous conditions such as warmer than typical waters. First referred to as the "Blob" during winter 2013-2014, a large expanse of unusually warm water in the Pacific is now considered a "marine heat wave". Since then, conditions got cooler than average offshore, but still warmer than average onshore. How are conditions now? The NOAA Hydrographic Services Review Panel (HSRP) held a meeting in Seattle on 18-20 April 2017 to seek public comments and recommendations on navigational products provided by the National Ocean Service (NOS). As part of this meeting, NANOOS director Jan Newton presented on the different navigational tools NANOOS provides, highlighting the Boaters, Maritime Ops, and Tuna Fishers applications. NOAA's Western Regional Environmental Conditions and Impacts Coordination project brought back its popular webinar series again and will present every other month. The March 2017 webinar summarized coastal environmental conditions and impacts in the Western Region. The webinar included contributed slides from NANOOS, CeNCOOS and SCCOOS, who will regularly report on their local coastal ocean conditions. The next webinar will be 23 May 2017 at 1 pm. Contact us at NANOOS if you want to participate. Three scientific papers published recently feature NANOOS PIs, data, and information. The articles "Extreme Oceanographic forcing and Coastal Response Due to the 2015-2016 El Niño" and "New Ocean, New Needs: Application of Pteropod Shell Dissolution as a Biological Indicator for Marine Resource Management" include NANOOS PIs as co-authors. Last year’s Pacific Anomalies Workshop 2, organized by NANOOS, is mentioned in the article "Satellite Sea Surface Temperatures Along the West Coast of the United States During the 2014–2016 Northeast Pacific Marine Heat Wave". NANOOS provides an on-line overview of what scientists have learned regarding the large, unprecedented Harmful Algal Bloom (HAB) along the U.S. west coast during spring 2015. Prepared by JISAO scientist Ryan McCabe, the overview explains that the HAB was initiated by anomalously warm water temperatures. This has implications for a higher occurrence of HAB events as waters warm, which presents ecological, economic, and human health repercussions. NANOOS is collaborating with UW, NOAA, and other partners on a project to provide HAB forecasts. NANOOS makes it a priority to engage users via outreach events throughout the Pacific Northwest. NANOOS contributed to the American Meteorological Society "WeatherFest" on January 22nd in Seattle, Washington, to heighten awareness of weather and ocean forecast and real-time data on NVS. NANOOS attended the annual Sound Waters "one-day university for all" on February 4th at Whidbey Island, Washington, to promote public ocean literacy. On February 25-26th we will be at the Saltwater Sportsmen’s Show in Salem, Oregon, demonstrating the NVS Boaters and Tuna Fishers apps. Manuscripts are being solicited by AGU Journals (JGR-Oceans, GRL, JGR-Atmosphere, JGR-Biogeosciences) for the special collection titled "Midlatitude Marine Heatwaves: Forcing and Impacts" This special collection was motivated by the two Pacific Anomalies Workshops (PAWs) organized to discuss multi-year warm anomalies. The PAW2 report synthesizes knowledge on status and driving mechanisms of Pacific anomalies and their effects in three topical areas; atmosphere-ocean interactions; open ocean-coastal interactions; and ecosystem responses. Included are recommendations on needs (observations, modeling, or studies) limiting our understanding or ability to forecast anomaly dynamics or impacts. IOOS, the National Ocean Service (NOS) and the National Weather Service (NWS) have released the "National Strategy for a Sustained Network of Coastal Moorings". The Strategy evaluates the existing inventory and provides ten recommendations towards development of an implementation plan. The primary recommendation is to identify regional observing gaps best addressed with coastal moorings, using a targeted stakeholder engagement approach to integrate stakeholder input. This effort will be led jointly by NOAA mooring operators and IOOS RAs, like NANOOS. NOAA’s Western Regional Environmental Conditions and Impacts Coordination project brought back its popular webinar series again and will present every other month. The January 2017 webinar summarized coastal environmental conditions and impacts in the Western Region. The webinar included contributed slides from NANOOS, CeNCOOS and SCCOOS, who will regularly report on their local coastal ocean conditions. The next webinar will be 20 March 2017 at 1 pm. Contact us at NANOOS if you want to participate. The newest version of the NANOOS Visualization System (NVS) has been released. This new version includes a new "Routes" feature that allows users to create, edit, and download waypoints before going out on the water. This new feature is available in the Data Explorer, Boaters, Tuna Fishers, and Maritime Operations NVS Apps. NVS version 5.2 also includes modifications to cruise data in the Salish Cruises App; cruises are now listed by year in a user-friendly format for accessing data. The Coastal Data Information Program (CDIP) recently redeployed the Umpqua CDIP wave buoy with a new mooring and acoustic release off the coast of Charleston Harbor, Oregon. Important to coastal navigators and planners, CDIP buoys measure wave height, period, and peak direction. Data from this asset and other CDIP buoys are available via NVS. The October 2016 "NANOOS Observer" newsletter has been posted. This edition highlights some of the work that NANOOS has accomplished within the last five months. These announcements include new features on the NANOOS Visualization System (NVS), education and outreach events, published reports, and other exciting projects. To automatically receive new NANOOS Observer editions in the future, click the "Newsletter" icon at the top of the page and enter your email address. The NANOOS Visualization System (NVS) version 5 is now live with several exciting new features. One of the key additions to this update include a new "Current Conditions" feature within many NVS apps. This new feature provides a regional view of data from all assets reporting real-time water and air temperatures, barometric pressures, waves, and wind measurements. NVS 5 also includes new profile and heatmap plots for select profiler platforms, including ORCA buoys. Additionally, the NVS Salish Cruises app now provides downloadable cruise data from 1998 to 2016 in the Salish Sea. A comprehensive look at Puget Sound marine conditions for the year 2015 is now available. Physical, chemical, and biological information ranging from large-scale climate variations to local biota monitoring are summarized to provide a thorough overview of Puget Sound conditions for 2015. The report includes many contributions from NANOOS. This report is published by Puget Sound Partnership and NOAA's Northwest Fisheries Science Center as part of the Puget Sound Ecosystem Monitoring Program. NOAA's National Centers for Coastal Ocean Science (NCCOS) are funding development of a harmful algal bloom (HAB) forecast in the Pacific Northwest to support management of shellfisheries, clamming beaches, and human health. The experimental monitoring and forecasting system will launch in 2017, with forecast bulletins predicting bloom location and concentration several days in advance. This new development is a joint effort between NOAA, members of the Makah Tribe, the University of Washington, the University of Strathclyde, the Oregon Department of Fish and Wildlife, and NANOOS. The report summarizes knowledge synthesized regarding status and driving mechanisms of Pacific anomalies and their effects, as well as recommendations emerging from the workshop. The report addresses three topical areas: atmosphere-ocean interactions; open ocean-coastal interactions; and ecosystem responses. Included are specific recommendations on needs (observations, modeling, or studies) that limit our understanding or ability to forecast dynamics or impacts of the anomalous conditions. Two Pacific Anomalies Workshops have been held to discuss what is known regarding the atmospheric, oceanic, and biological aspects of the multi-year warm anomalies (aka the blob) as well as the 2015-16 El Niño. Presentations and videos from both workshops are on-line. The new Real-Time HABs website provides timely information on toxic harmful algal blooms in the Pacific Northwest. View the latest harmful algal bloom measurements from the Environmental Sample Processor (ESP), an underwater robot located on the NEMO mooring 13 miles off La Push, Washington. Real-time data on water conditions including currents, temperature, salinity and dissolved oxygen are available. This NANOOS website is provided to help understand where toxic algae may be moving and the conditions that may influence toxic blooms. The ESP project and website are funded through IOOS Ocean Technology Transfer program. The new Global Ocean Acidification Observing Network (GOA-ON) data portal, built using NANOOS NVS technology, was launched at Secretary Kerry's "Our Ocean Conference" on 16 September 2016 by NOAA Administrator Dr. Sullivan. This user-interactive portal features global ocean acidification data, such as pH, pCO2, and aragonite saturation state, as well as asset inventory and metadata from world-wide GOA-ON partners (330 from 67 countries). The portal was made possible through the vision of GOA-ON and support from NOAA, IOOS, and the University of Washington. Tracking the "Blob" on NVS — Is it Back? The NVS Climatology App provides comparisons of current and past water temperature and other variables from buoys and satellites, allowing you to track anomalous conditions such as warmer than typical waters. First referred to as the "Blob" during winter 2013-2014, a large expanse of unusually warm water in the Pacific is now considered a "marine heat wave". Conditions offshore appear to be getting warmer again, and with a circular footprint similar to its appearance back in December 2013. NANOOS was deeply honored to remotely host NOAA Administrator Dr. Kathryn Sullivan, while she was visiting NOAA PMEL, for a short address and Q&A at the annual NANOOS Governing Council meeting on 11 August. Around 30 attendees from diverse NANOOS member institutions in Washington, Oregon, and British Columbia were present. The annual meeting reviews progress to date, future plans, and provides a forum for discussion and feedback. NANOOS is pleased to announce that global, hindcast WaveWatch III monthly mean, climatology and anomaly wave fields for the period Jan 1979 - May 2016 are now available via the NVS Climatology app. These monthly views are derived from fields originally generated via the Centre for Australian Weather and Climate Research (CAWCR), a collaboration between Australia's CSIRO and Bureau of Meteorology. A recent phytoplankton bloom in Hood Canal, Washington was seen from space! NASA's satellites recorded images of a rare bloom of coccolithophores occurring this summer in Hood Canal and Dabob Bay, Washington. Coccolithophores are phytoplankton with calcium carbonate plates that reflect light, showing up as a milky turquoise color. Washington Sea Grant, a NANOOS partner, observed the bloom from the beach. Will There Be a Hood Canal Fish Kill This Year? Fish kills in Hood Canal occur when low oxygen (hypoxic) waters move up to the surface from depth, usually by seasonal southerly winds. 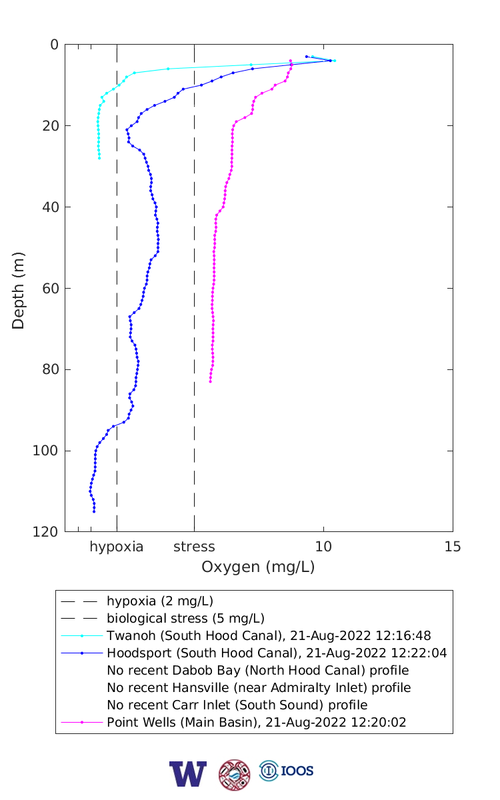 Already we see strong hypoxic conditions in lower Hood Canal this summer. See the "Fish Kill Alert" from the UW ORCA buoy group, NANOOS partners, and follow the oxygen levels on NVS. NANOOS is pleased to announce that it is now serving National Science Foundation Ocean Observatories Initiative (OOI) data from the Pacific Northwest Coastal Endurance Array through our NANOOS Visualization System (NVS). Our data team has harvested these data streams from the publicly available OOI site, porting them into NVS so our users can see multiple sources of data in our coastal waters, including NSF OOI, NANOOS, NSF CMOP, NOAA NDBC, CDIP, and others. Kudos to the visionary leaders at NSF and NOAA who worked to assure this compatibility so we can better serve those wanting coastal data from Washington and Oregon waters. NANOOS was awarded the first of five years funding for continued operation from the U.S. IOOS office, including funding from NOAA's Ocean Acidification Program for activity in both Oregon and Washington.NANOOS will continue investment in observing infrastructure and computer modeling for the Pacific Northwest coastal ocean, estuaries, and shorelines. These diverse assets provide real-time information and integrated data products, allowing users to identify and forecast environmental conditions. These funds will improve the ability of our region to interact with the coastal ocean in a way that enables decisions to optimize human safety, economy, and a healthy environment. IOOS has released the Manual for Real-Time Quality Control of High Frequency Radar Surface Current Data. This manual is the 9th in a series of guidance documents produced by IOOS to establish authoritative procedures for collecting high-quality data, the Quality Assurance/Quality Control of Real-Time Oceanographic Data (QARTOD) Project. New HAB Monitoring in Real-Time! The IOOS-supported "Environmental Sample Processor" was successfully deployed off La Push at our NEMO buoy and is relaying data on harmful algal bloom (HAB) species and domoic acid toxin concentration through the NVS portal. Kudos to the team from UW and NOAA, as well as our other academic, non-profit, industry, tribal, and state partners, in making this dream reality! The Western Regional Environmental Conditions and Impacts Coordination project May 2016 webinar summarized coastal environmental conditions and impacts, including contributed slides from NANOOS. The latest version of the NANOOS Visualization System (NVS) is now live! Check out usability improvements and the addition of three new data streams: surface currents collected via the Port Townsend / Coupeville WA State Ferry and surface water temperatures collected via the Victoria Clipper, both of these are contributed by NANOOS partner Washington Dept. of Ecology. A third data product is oceanographic glider sections off La Push from NANOOS partner University of Washington, collected during 2014-2015 and 2015-2016. A new data stream from a shore station on Quadra Island, BC is now available on NVS. This data stream from NANOOS member Hakai Institute, monitors ocean acidification conditions in near real-time using a "Burke-o-lator" sensor system located at the Hakai Institute's Field Station at Hyacinthe Bay. Two Pacific Anomalies Workshops have been held to discuss what is known regarding the atmospheric, oceanic, and biological aspects of the multi-year temperature anomaly known as the "Blob" as well as to note the 2015-16 El Niño. Presentations, agenda, and videos from both workshops are on-line. A new buoy about two miles out in Bellingham Bay is collecting streams of data around the clock that scientists and students will use to monitor the health of north Puget Sound and the Salish Sea. The NVS Climatology App provides comparisons of current and past water temperature from buoys and satellites, allowing you to track warmer than typical water, both from the large expanse of unusually warm water in the Pacific, known as the "Blob", and from the 2015-2016 El Niño. Can’t tell them apart? Hear what experts said at the second Pacific Anomalies Workshop (PAW2). A new buoy, Se'lhaem, was deployed in Bellingham Bay on February 11th. The Center for Coastal Margin Observation and Prediction, through its education partner University of Washington, deployed the buoy in partnership with Northwest Indian College and Western Washington University. The Western Regional Environmental Conditions and Impacts Coordination project January 2016 webinar summarized coastal environmental conditions and impacts, including contributed slides from NANOOS and the CA OOSes. Have we seen the end of the "Blob" in BC? Not so fast. The Hakai Institute’s two field stations in British Columbia have a front row seat to the dynamic changes going on in the oceans. The second Pacific Anomalies Workshop will be held on the University of Washington campus on 20-21 January. Please register now. This workshop is sponsored by U.S. IOOS, NOAA OAR Ocean Climate Observation Program, NOAA Western Regional Team, Washington Sea Grant, and California Sea Grant. Northwest Winter Weather: El Niño, Coastal Effects, No More "Blob"
Researchers tracking what the season will deliver to the Pacific Northwest region. The NANOOS Observer newsletter provides updates from NANOOS, our members and partners. NANOOS has created an overview video demonstration that walks users through various NVS features and applications, and introduces other NANOOS resources. King Tides, the highest tides of the year, happen every winter when the moon is closest to Earth. This winter's King Tides are Nov. 24-27, Dec. 23-26, and Jan. 13-15. Use NVS to see tides near you. Both OR and WA have photo projects inviting citizens to contribute King Tide images; to help visualize what sea level rise may look like in the coming decades. A new video from UW's Applied Physics Lab shows how near real-time Oceanic Remote Chemical Analyzer buoy data, available on NVS, provided constant monitoring of evolving conditions and allowed scientists to warn of possible fish kill events in the oxygen-starved waters of Hood Canal well in advance. An art exhibit featuring NANOOS assets is now open at the Frye Art Museum in Seattle. Local artist D.K. Pan filmed at sunset from NOS/CO-OPS Tsunami Capable Tide Stations along the West Coast to create his 39 minute video. According to Pan, "the project serves as a poetic document of place" that will bring awareness to vulnerable coastal communities. NANOOS Director gives an overview of the IOOS ocean acidification data portal "IPACOA" serving NOAA OAP, shellfish grower, and other data streams spanning U.S. Pacific basin waters. IOOS has released the Manual for Real-Time Quality Control of Dissolved Nutrients Observations. This manual, which was co-edited by NANOOS' own Emilio Mayorga, is the 8th in a series of guidance documents produced by IOOS to establish authoritative procedures for collecting high-quality data, the Quality Assurance/Quality Control of Real-Time Oceanographic Data (QARTOD) Project. "Seafood 101" explores the science of seafood sustainability, the surrounding ecosystem, careers within the fishing industry, the value of eating wild-caught seafood and the role of NOAA in managing healthy fisheries. The potential impact of the warm water "Blob" on West Coast fisheries and tracking it via NANOOS' Climatology App are featured on page 4. Seafood 101 OnlineHow to Track "the Blob"
The large expanse of unusually warm water in the Pacific Ocean, the "Blob", persists off the coast of OR and WA and has invaded inland waters. The NVS Climatology App provides comparisons of current and past water temperature from buoys and satellites, allowing you to track the warmer than typical water. Fish kills in Hood Canal occur when hypoxic waters are rapidly upwelled to the surface, usually by seasonal southerly wind storms. Abnormal weather and oceanic conditions have resulted in extreme hypoxia in Hood Canal this year. Fish kill risk depends on whether seasonal storms or complete flushing occur first. Find out more from the Advisory and follow the oxygen levels on NVS. WA Dept. of Health (WADOH) shellfish safety data is now on NVS. WADOH deploys sensors seasonally to monitor for high water temperatures that increase the risk of growth of Vibrio, a bacteria that sickens humans via contaminated shellfish. WADOH, tribes, and shellfish growers are reducing this risk by restricting shellfish harvest when environmental conditions favor Vibrio growth. NANOOS invites your input to our response to the US IOOS FFO guiding the next 5 years of NANOOS operations. We will follow the "timeline" below. For existing NANOOS efforts, PIs must fill out a 2-page "existing" LOI. For new efforts, which can be proposed by anyone, fill out a 2-page "new" LOI. The Pacific Regional Associations of U.S. IOOS are pleased to announce the release of the new IOOS Pacific Region Ocean Acidification (IPACOA) data portal. This portal provides relevant ocean acidification data from throughout the IOOS Pacific regions of Alaska (AOOS), Washington and Oregon (NANOOS), Central and Northern California (CeNCOOS), Southern California (SCCOOS), and the Pacific Islands (PacIOOS). To improve our understanding of ocean and atmosphere conditions offshore the Pacific Northwest, a suite of products are now available in the new NVS Climatology App. The new App shows climate (long-term average conditions) and anomalies (present-day departures from average), allowing users to visualize if current conditions are abnormal. Is a warm sea water "blob" present? Check out this cool app! To advance science and enable better decision making, the Ocean Technology Transition Project through U.S. IOOS and NOAA's Ocean Acidification Program has awarded two grants to NANOOS and our partners to support forecasting of harmful algal blooms (HABs) off the Pacific Northwest coast and to improve ocean acidification (OA) observing capability along the US west coast. Harmful Algal Blooms (HABs) are a concern in the Pacific Northwest. This year an exceptionally large West Coast bloom has closed regional razor clam and crab fisheries. New event response funding from NOAA will enable NANOOS and partners to provide improved forecasts and data to resource managers, shellfish growers, and researchers for managing HAB response. The marine waters of the Pacific Northwest are particularly vulnerable to ocean acidification. NANOOS, with its partners, is collecting and making available ocean acidification related water quality data from sensitive areas along the coast and within Puget Sound. A 6.9 earthquake hit about 50 miles west of the Northern California coast on Sunday, March 9, 2014. Use the NVS Tsunami Evacuation App to view earthquake event details and U.S. National Tsunami Warning Center warnings as well as inundation maps and evacuation routes in tsunami hazard zones. NVS (NANOOS Visualization System] is a web app that provides easy access to data and visualizations. NVS provides a wide range of data and visualizations for observations and forecasts in a consistent format.